Who ordered a cheese plate? There’s nothing like sticking on a good cheesy rom com to cure whatever ails you. The lines might be corny, they might be a little unrealistic, but they stick in your brain – and these are the ones that make us shout “YAAAAAY!” every time we re-watch. 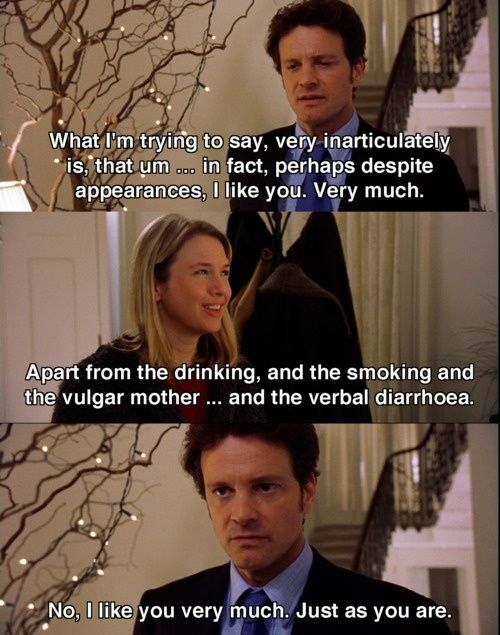 And just like that, we fell in love with Mark Darcy/Colin Firth. This is pure Brie, and widely regarded as one of the worst film quotes of all time, but c’mon – she was definitely saying it with a wink. Right? Four Weddings and a Funeral fans, weigh in. Kat’s poem for Patrick always gets us, especially since we learned that the tears Julia Stiles cried were unplanned and completely real. Ah god. “Nobody puts Baby in the corner” is the big line, but in our opinion, this is better. Go on Baby! Tell him how you FEEL. So this isn’t the most famous movie line, but every 2000s girl worth her salt has dreamed of delivering this line like Hilary Duff did to Chad Michael Murray in A Cinderella Story. It’s just so DRAMATIC. Richard Curtis appears three times on this list, because my god can the man write a good soppy script. This particular Notting Hill line is perfect, in its own awful way. Underrated! 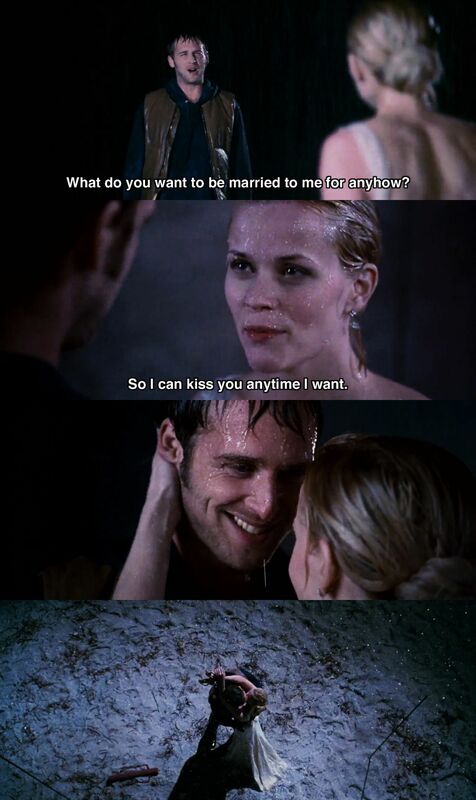 Both this line and How To Lose A Guy In 10 Days in general. We adore a ‘haters-to-lovers’ storyline, and Kate Hudson and Matthew McConaughey really gave it to us. This scene in Jerry Maguire is packed with magic moments. “You had me at ‘hello'”! “You complete me”! Just so much goodness. Harry isn’t terribly likeable until this moment. He even starts his declaration of love to Sally by kind of insulting her a little, but then… ah. I love that you get cold when it’s 71 degrees out. I love that it takes you an hour and a half to order a sandwich. I love that you get a little crinkle above your nose when you’re looking at me like I’m nuts. I love that after I spend the day with you, I can still smell your perfume on my clothes. And I love that you are the last person I want to talk to before I go to sleep at night. And it’s not because I’m lonely, and it’s not because it’s New Year’s Eve. I came here tonight because when you realise you want to spend the rest of your life with somebody, you want the rest of your life to start as soon as possible. The Princess Diaries means a great deal to a certain generation of women, and this line, delivered as it was by the beautiful Anne Hathaway wearing a beautiful gown in a beautiful rose garden, was pure wish fulfilment. Were you even ready for Justin Long’s commitment-phobe character to whip this out in He’s Just Not That Into You? We weren’t, and how we swooned. Eh, spoiler alert for the 2002 Reese Witherspoon vehicle Sweet Home Alabama, but when she realises that her estranged husband Jake was her true love all along, she loads on the cheese. AND WE LOVED IT. It takes the whole damn film for Meg Ryan and Tom Hanks to discover that they were secret pen pals, but when they finally did, it was extremely sweet.